The raptor scared the hell out of kids (and some adults) in Jurassic Park, but that dinosaur isn’t as ferocious as the Ford F150 Raptor. It’s a beast – in the best possible way. So what has changed in the new 2017 update to the Ford Performance supercab? Well, it’s 500 pounds lighter, thanks to the high-strength, military-grade, aluminum alloy fixed to its high-strength, boxed steel frame. It also has a higher running clearance and a new four wheel drive torque on demand transfer case. That means you can switch seamlessly between clutch-driven, on-demand all-wheel drive and durable, mechanical-locking four-wheel drive. Yes, it’s a beast – on and off road. 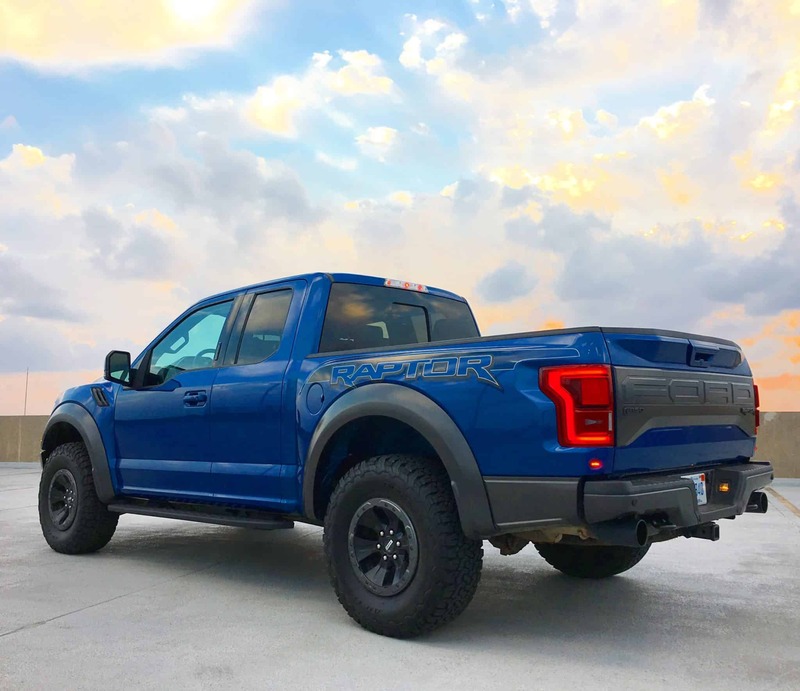 The 3.5L EcoBoost engine which may seem a little wussy and tree hugging, until you realize that it puts out 450 horsepower and 510 lb.-ft. of torque. In fact, it delivers more power than the previous 6.2L V8. How does it do that? Well, with twin-turbo, intercooled DOHC 24-valves, direct fuel injection and a 10-speed automatic transmission with manual-shifting mode. There’s even a Terrain Management System which means that you can set it for optional street driving, but also choose from five other steering wheel button controlled modes, including mud, sand and Baja. If you do plan on racing, the 3.0-inch internal-bypass Fox Racing shocks in place of the old 2.5s will help make it a less bumpy ride. If you are using it for driving in town, you will appreciate the truly luxurious interior. Optional extras include full Sat Nav, Bluetooth, media streaming, heated and cooled seats, Remote Start, door code entry, 360 degree camera, rear parking sensors, blind spot awareness monitor and cross path detection. Not forgetting perhaps the most important luxury touch – a full black leather interior. 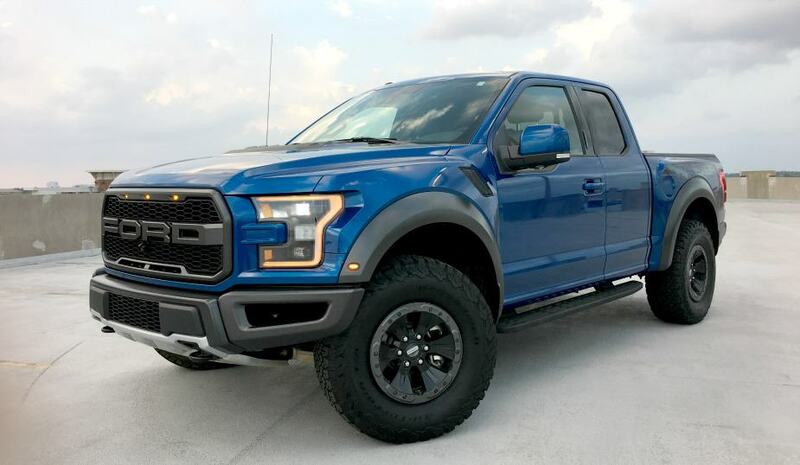 From the huge metal Ford logo on the front grill to the true dual-exhaust system with twin outlets notched in the rear bumper (for that real beastly growl), the Ford F150 Raptor is a monster. Although there is a sweet interior hidden in that ‘you don’t want to mess with me’ shell. It’s something that can take you anywhere you want to go (really, anywhere) and take you there in comfort and style. It will also get you there quickly, going from zero to sixty in approximately 5.3 seconds. Forced to face off against a Jurassic Park Raptor and the Ford F150 Raptor, you’d throw yourself on the claws of the velociraptor every time. Eric White is part of the team at 51st State Autos, the UK’s largest importer of American Pickup Trucks in the UK.